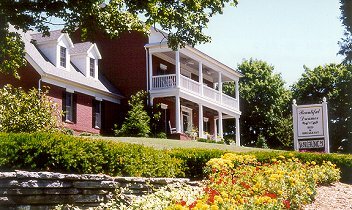 Bardstown Kentucky Bed and Breakfast, Beautiful Dreamer Bed & Breakfast Inn. From the double front porches of this Federal' style home you can enjoy a stunning view of My Old Kentucky Home, the house Stephen Foster made famous in song. Warmly decorated with antiques and cherry furniture. Four rooms with rivate baths. Three have jacuzzi tubs, (2 two person and 1 single person). All aths have hairdryers. Each room has a queen bed (2 with canopies) color TV /cable , some have VCRs. Great rooms for that special occasion. Full, 5 course breakfast, and on those cool, frosty mornings breakfast will be served in front of a woodburning fireplace. Early morning coffee and tea available efore breakfast. Cold drinks and snacks available at all times in guest snack area. Located in Bardstown, plenty of off-street. Listed in "Best Places to Stay in the South". Rated 4 1/2 stars in the "Unofficial Guide to Bed & Breakfast". This and other Kentucky Bed and Breakfast Inns can be found here in The Register.